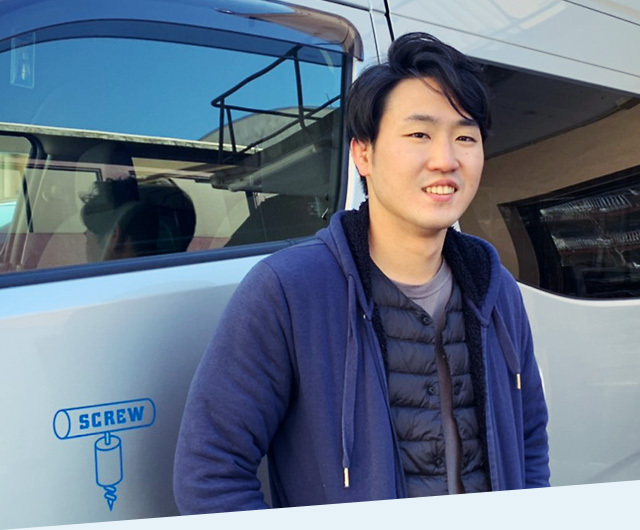 Our Employees - Scott Ishida｜SCREW INC.
Hello, my name is Koji Scott Ishida and I`m a Camera/Steadicam Operator at SCREW Inc. I grew up all my life in the US however, moved back to Japan three years ago and joined SCREW Inc.
From a young age, I always loved motion pictures but it wasn`t until high school where I firmly decided that I wanted to work in the film industry. From there, I decided to go to Columbia College Hollywood, a film school in Los Angeles to pursue film making. I challenged myself with various jobs and departments but the position that gave me the most inspiration was the camera/steadicam operator. From the moment I laid eyes on the operator, I was amazed by the kind of work the operator was doing. But most of all, I was mesmerized by the kind of shots the operator was shooting. From there, I decided that I want to be a camera/steadicam operator. In order to become an operator it take a great deal of training, studying, experience, and most of all, passion. Also, a little bit of luck. Although it is a very hard and physical job, the feeling you get when you nail a difficult shot or simply when the director or DP expresses joy from the executed shot, you really can`t trade it for anything else. There`s a lot of pressure that goes along with this job but to incorporate your own ideas on top of the given directions can be very fun and exciting. I would like to continue working hard to become a world class operator.